As we march toward that point in February when pitchers and catchers report to camp, the Tampa Bay Rays have started to show signs of life in the midst of a quiet offseason. Within the last few days the Rays hosted their annual Winter Development Program, and announced the addition of 17 players to the Major League Spring Training roster. 20 Tampa Bay Rays minor league players arrived at Tropicana Field for the team’s annual Winter Development Program. This year’s group includes last year’s first round choice OF Garrett Whitley, and pitcher Brent Honeywell ― one of the game’s top 100 prospects as ranked by Baseball America. 18 others attended the camp including hurlers Dylan Floro, Mike Franco, Reese Karalus, German Marquez, Jose Mujica, Benton Moss, Ryne Stanek, Alexis Tapia, and Angel Yepez; catchers Chris Betts and Nick Ciuffo; infielders Jake Cronenworth, Devin Davis, Jake Hager, Brandon Lowe, Adrian Rondon and Kean Wong, and outfielder Zac Law. Honeywell is coming off a successful first full season in professional baseball, collecting a 9-6 record and a 3.18 ERA in more than 130 innings between the Bowling Green Hot Rods and Charlotte Stone Crabs. Rondon appears ready to take the next step toward realizing his dream of reaching the big leagues. Mitch Lukevics, Rays Director of Minor League Operations, indicated that the infielder will remain in the states after the camp has come to a close to work out with several Rays minor leaguers, in Port Charlotte. The Winter Development Program comes to a close on Thursday. The team announced the signing of five minor league free-agents on Tuesday. Additionally, 12 minor league players received Spring Training invitations. The addition of 17 total players brings the number of players the Rays to Major League Spring training to 57. Jhan Marinez, who re-signed with the Rays organization after posting an impressive 4-1 record with a 2.27 ERA with Triple-A Durham last season, will join four others at the team’s Spring Training facility in Port Charlotte ― right-handed knuckleballer Eddie Gamboa (who spent last season with the Orioles Triple-A affiliate Norfolk), RHP Tyler Sturdevant (formerly of the Indians organization), journeyman LHP Dana Eveland, and 1B/DH Kyle Roller (masher of 96 homers over the past six seasons with the Yankees organization). Pitchers Ryan Garton, Parker Markel, Mark Sappington, Jaime Schultz, Neil Wagner, and Jonny Venters; catcher Jake DePew; outfielders Johnny Field and Dayron Varona, and infielders Patrick Leonard, Juniel Querecuto, and Daniel Robertson round out the list of 12 players who are already within the Rays organization. Of the aforementioned 12 players, only Robertson has appeared with the team in Major League camp. Eveland, 32, has spent parts of 10 seasons in the majors (2005-12, 2014-15), going 20-27 with a 5.27 ERA (423.1-IP, 248-ER) in 154 games (61 starts). He made 10 appearances in the majors last season for the Atlanta Braves, his ninth major league team. He spent most of the 2015 season pitching in the International League between the Triple-A affiliates of the Boston Red Sox, Braves and Baltimore Orioles, combining to go 4-0 with a 1.95 ERA (55.1-IP, 12-ER) in 33 apps (3 starts). Gamboa, 31, holds a 50-52 record and 3.61 ERA (806.1-IP, 323-ER) over eight minor league seasons, all with the Baltimore Orioles organization. He pitched for Triple-A Norfolk in 2015, going 8-11 with a 4.61 ERA (113.1-IP, 58-ER) in 26 games (19 starts). Since converting into a knuckleball pitcher in 2013, he has gone 19-29 with a 4.30 ERA (364.1-IP, 174-ER) in the minor leagues. Mariñez, 27, was named to the International League midseason All-Star Team in 2015, his first season with the Rays organization. He went 4-1 with a 2.27 ERA (67.1-IP, 17-ER) over 50 appearances between Double-A Montgomery and Triple-A Durham, following a non-roster invite to spring training. The righthander holds a career 4.03 ERA in the minors, and has pitched in six games in the majors between the Florida Marlins (2010) and Chicago White Sox (2012). Sturdevant, 30, has gone 19-12 with a 2.81 ERA (301-IP, 94-ER) over six minor league seasons with the Cleveland Indians organization. He pitched to a 3.16 ERA (31.1-IP, 11-ER) across 26 appearances with Triple-A Columbus in 2015 following a 50-game suspension to start the season for violating the Minor League Drug Prevention and Treatment Program. Roller, 27, is a career .268/.362/.458 hitter with 96 home runs and 375 RBI over six minor league seasons with the New York Yankees organization. He spent the 2015 season with Triple-A Scranton/Wilkes-Barre, making the International League midseason All-Star Team and earning the All-Star Game’s Top Star honors. He hit .232/.339/.390 (99-for-426) with 14 homers and 59 RBI last season for Scranton. DePew, 23, spent the 2015 season with Montgomery, batting .228/.280/.340 (45-for-197) in 55 games and throwing out 46.6 percent of attempted base stealers. He holds a career 43.9 percent eraser rate across six minor league seasons with the Rays organization. He was selected by the Rays in the ninth round of the 2010 June Draft. Field, 23, was named to the Southern League midseason All-Star Team in 2015, batting .255/.329/.447 (110-for-432) with a career-high 14 home runs, 66 RBI and 18 stolen bases for Montgomery. He ranked third in the SL in doubles (33) and fourth in extra-base hits (51), and his 66 RBI ranked fifth among Rays minor leaguers. He was selected by the Rays in the fifth round of the 2013 June Draft, and holds a career .273/.342/.448 (310-for-1,137) line over three minor league seasons. Garton, 26, went 6-1 with a 2.95 ERA (61-IP, 20-ER) in 41 appearances for Montgomery last season. He led Southern League relief pitchers in opponents’ average (.197) and strikeouts per nine innings (10.33). He was selected by the Rays in the 34th round of the 2012 June Draft, and is 20-6 with a 2.72 ERA (225-IP, 68-ER) across four minor league seasons. Leonard, 23, spent the 2015 season with Montgomery, batting .256/.350/.408 (114-for-446) with 10 homers and 43 RBI and ranking tied for fourth in the Southern League with 32 doubles. Over four minor league seasons, he has hit .254/.338/.415 (401-for-1,576) with 46 homers and 204 RBI. He was acquired by the Rays as part of a seven-player trade with the Kansas City Royals in December 2012. Markel, 25, spent the majority of the 2015 season with Montgomery, going 5-3 with a 3.23 ERA (53-IP, 19-ER) in 42 appearances. He received a late-August promotion to Durham and pitched in five games there to end the season. He was selected by the Rays in the 39th round of the 2010 June Draft, and has gone 27-23 with a 4.22 ERA (395-IP, 185-ER) in six minor league seasons since. Querecuto, 23, split the season between Class-A Charlotte, Montgomery and Durham, batting a combined .256 (74-for-289) in 89 games. He started the season with Charlotte and was named to the Florida State League midseason All-Star Team before his first promotion. Following the season, he played for the Cardenales de Lara of the Venezuelan Winter League and hit .329 (52-for-158) in 51 games. He was signed by the Rays as a free agent in 2009 and has hit .255 (399-for-1,563) in five minor league seasons. Robertson, 21, was limited to 78 games with Montgomery in 2015 due to a broken hamate bone. He hit .274/.363/.415 (82-for-299) with 20 doubles, five triples, four homers and 41 RBI there, and played in an additional four games on a rehab assignment for the Gulf Coast League Rays. Following the season, he played in 22 games for the Mesa Solar Sox of the Arizona Fall League and was named to the AFL Rising Stars Team. Over four minor league seasons, he has hit .283/.371/.429 (411-for-1,451) with 33 home runs and 177 RBI. He was acquired by the Rays as part of a five-player trade with the Oakland Athletics in January 2015. Sappington, 25, went 3-6 with a 3.69 ERA (68.1-IP, 28-ER) in 48 games with Montgomery in 2015. He was also named the winner of the 2015 Erik Walker Community Champion Award. The annual award recognizes one Rays minor leaguer who exemplifies teamwork, sportsmanship and community involvementâattributes exhibited by former Rays minor league pitcher Erik Walker, who died tragically in October 2006 in a canoeing accident. Sappington, who was acquired by the Rays from the Los Angeles Angels in November 2014, is 20-23 with a 4.44 ERA (374.2-IP, 185-ER) in four minor league seasons. Schultz, 24, went 9-5 with a 3.67 ERA (135-IP, 55-ER) and 168 strikeouts in 27 starts for Montgomery in 2015, earning Southern League midseason All-Star honors and ranking among SL leaders in ERA (ninth), starts (tied for first), strikeouts (first) and opponents’ average (.218, second). His 168 strikeouts led Rays minor leaguersâfive more than lefthander Blake Snellâand were the most in the organization since Matt Moore in 2011 (210). He was selected by the Rays in the 14th round of the 2013 June Draft and is 14-8 with a 3.23 ERA (239.1-IP, 86-ER) in three minor league seasons. Varona, 27, was signed by the Rays on May 7, 2015 and hit .377 (26-for-69) in 15 games with Charlotte before a promotion to Montgomery, where he batted .264/.310/.458 (73-for-277) with 10 home runs and 50 RBI in 69 games. Following the season, he played in five games for the Gigantes de Carolina of the Puerto Rican Winter League. Prior to signing with the Rays, he played seven seasons in the Cuban National Series where he held a career .312 (412-for-1,320) batting average and .376 on-base percentage. Venters, 30, has spent parts of three seasons (2010-12) in the majors with the Atlanta Braves, going 15-10 with a 2.23 ERA (229.2-IP, 57-ER) and averaging 10.1 strikeouts per nine innings. The 2011 All-Star was signed by the Rays on March 11, 2015 and is currently rehabbing from a third Tommy John surgery. He has not pitched in a game at any level since the 2012 National League Wild Card Game, when the Braves lost to the St. Louis Cardinals. Wagner, 32, has spent parts of three seasons in the majors with the Oakland Athletics (2011) and Toronto Blue Jays (2013-14), going 2-4 with a 4.92 ERA (53-IP, 29-ER). He was signed by the Rays on September 17, 2014 and spent the 2015 season rehabbing from Tommy John surgery in Port Charlotte. On Friday, the Tampa Bay Rays released their 2016 Spring Training schedule. 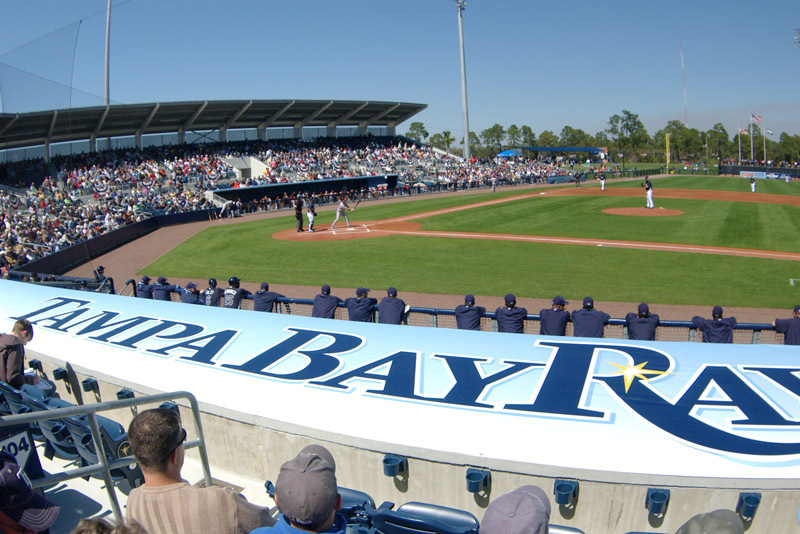 Tampa Bay will open the 2016 Grapefruit League season on March 2 against the visiting Washington Nationals at Charlotte Sports Park, and the 29-game schedule will conclude on April 1 against the Detroit Tigers in Lakeland. The schedule does not yet include any games in Cuba. The Rays were picked by Major League Baseball to play two spring training games in Cuba pending government approval. The games would take place during the final week of March, and if the Rays do get the opportunity to play in Cuba, it would be the first time since 1999 that an MLB team (the Baltimore Orioles) played there. Pitchers and catchers will report to camp on February 21, while the first full squad workout is scheduled for February 26. Single game tickets range from $10 to $29, although the March 12 game against the New York Yankees and the March 13 game versus the Boston Red Sox are listed as premium games with prices between $15 and $32. Tickets will go on sale starting December 4th at 10:00 AM, however, the team will have a sale on Cyber Monday.